Entry fees are included in all tournaments for minimum stays of 6 nights. 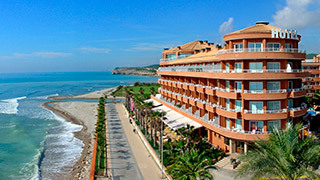 The Hotel Sunway Playa Golf & Spa Sitges is pleased to announce that it will host the Sunway International Bridge Festival of Sitges, from 01 to 09 December 2018, with more than 15.500 € in prize money. This official website of the tournament contains all the Festival information (rules, registration fee, accommodation, etc), as well as the contact details of the Organization, in case you have any further questions. The Hotel Sunway Playa Golf & Spa has organized the SUNWAY INTERNATIONAL BRIDGE TOURNAMENT weekend for four consecutive years. These bridge tournaments are unique in the city of Sitges (Barcelona). We can proudly look back at these weekends, which most players have thought successful. This year, we wanted to be more ambitious, and we decided to have a longer event. In this 3rd edition of this ambitious BRIDGE FESTIVAL format with 4 competitions that last for 9 days, we expect you very many!